If the assumption is made that traditional curating follows a centralised network model, then what is the position of the curator within a distributed network model? 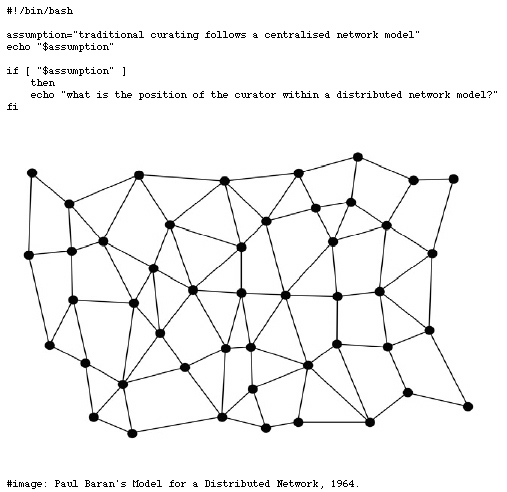 In other words, how distributed networks changed the nature of curating? The research takes this central question as a point of departure to investigate the practice of (online) curating that recognises information technology not simply on the level of medium or a tool of production, presentation and distribution of art works, but which attempts to incorporate it as part of the curatorial process itself. More precisely it posits the idea of software curating in which the curatorial task of selection, making sense of the indexed material, setting up relationships between works, and presenting them in fixed displays is somewhat deferred to a generative and machinic aspect of organising and assembling of data displays; to software and the network. This suggests curatorial process that is partially automated, dynamic, open, collaborative and redistributed in terms of the production process and power relations that arise from it. In such a scenario the sense of agency is necessarily redistributed between programmer, user, curator, the software, the Internet, and the system in general. For the iDC residency, the proposal builds upon the recent work for kurator project, a free software application for curating source code, and extends this general line of thinking about software curating to consider the potential of Content Management System (CMS) in terms of a distributed curatorial system. Joasia Krysa is a curator, researcher and currently a senior lecturer at the Faculty of Technology, University of Plymouth, UK. Her research interests focus on the practice of curating in the context of immateriality and online systems. In relation to this she has been developing a range of kurator.org projects including KURATOR software for curating source code (with Grzesiek Sedek); Curating, Immateriality, Systems conference (held at the Tate Modern, London, June 2005), and she is currently editing Curating Immateriality: The Work of the Curator in the Age of Network Systems book forthcoming early 2006 as part of the DATA browser series (volume 3, published by Autonomedia, New York). Previously she organised a number of conferences including (with Geoff Cox) globalica: artistic and conceptual tensions in the new world disorder as part of the WRO biennial 03 (Poland), and artist as engineer (2003), as part of an Arts Council of England initiative around socially-engaged arts practice, at i-DAT (UK). She is a co-editor of the DATA browser series, a member of Board of Directors at WRO Foundation Center for Media Art (Wroclaw, Poland), a member of Advisory Board and a referee for European Journal of Higher Arts Education (Amsterdam), and a Creative Advisor for Arts Council England, South West.